A growing healthcare company with a big yield? I'm intrigued. I'm a fan of dividends and, I have to admit, a high yield often gets my attention. That's why this healthcare company is attractive to me: It plays right into the demographic trends facing the world today, has been steadily growing its business, has a nearly 9% annualized dividend growth rate over the past decade, and has an over 5% yield. What company am I talking about? Ventas (NYSE:VTR), a real estate investment trust (REIT) that I think a market downturn could turn into a buy. Ventas is a healthcare REIT. It primarily owns properties that serve the daily needs of society's elderly -- around half of the company's net operating income comes from assisted living communities. It also owns medical office buildings, hospitals, and nursing homes. Basically, its nearly 1,300-strong property portfolio is widely diversified in the healthcare space. Ventas is a diversified REIT with an eldercare focus. Image source: Ventas. Ventas is poised to take advantage of the "graying of America" because most of the companies that lease space from Ventas provide services for an aging population. The number of people age 75 and older in the United States alone is expected to go from around 20 million today to 35 million by 2030. This age group is growing faster than any other, it visits doctors more than twice as often as other adults, and it spends five times as much on healthcare needs. Demographics are on Ventas' side domestically, and as it reaches across the pond to Europe. The company also has a strong history of returning value via dividend hikes. The current annual streak is only six years, not nearly as long as some of its direct competitors. But keep in mind that the streak originates in 2009, right at the end of the recession. While other REITs cut dividends during this downdraft, Ventas simply paused for a year, keeping its payment static between 2008 and 2009 before resuming its previous upward trend in 2010. And, despite that blip in what is a long history of returning value to shareholders via dividends, the REIT's 10-year annualized dividend growth rate is a robust 8.5% or so. The yield was recently 5.3%. For comparison, blue-chip Kimberly-Clark has a 10-year dividend growth rate of a little under 8%, and a yield of around 3.2%. If you want to be more specific to healthcare, Merck has a yield of around 3.1% and dividend growth over the past decade of a meager 2% or so. Sure, I'm cherry-picking examples. But don't underestimate how well-run this REIT is, or how well it's rewarded investors compared to companies that are frequently viewed as dividend growth investments. But you might consider that to be an apples-to-oranges comparison. Which is where a comparison to REIT competitors Welltower (NYSE:WELL) and HCP (NYSE:HCP) comes in. Welltower has a yield of around 5.5%, but a dividend growth rate of only about 3% over the past decade. HCP, meanwhile, has a nearly 6.4% yield, but has been having trouble with one of its largest tenants leading investors to shy away from the shares. It's dividend growth rate over the past ten years, meanwhile, was about 6%. So even though both of these REITs offer higher yields, they haven't provided as much dividend growth and with HCP there's a notable reason for the yield advantage. Ventas stands out from HCP and Welltower in other ways, too. For example, its debt compared to enterprise value is roughly 37%, in line with its peers. However, its fixed charge coverage is 4.4 times compared to 3.5 times and 3.8 times, respectively, for Welltower and HCP. It's payout ratio, meanwhile, is a reasonable 67% in the third quarter, HCP's payout ratio was around 72% and Welltower's was nearly 74%. This isn't to suggest that HCP or Welltower are bad companies in any way, just that Ventas appears to be the best of what are the three largest and most diversified healthcare REITs. I think there's a lot to like about Ventas' future and believe its past shows a healthy dedication to shareholders. It's the kind of company I would be happy to know my wife owned if I weren't around, even though it doesn't have an over 100-year history behind it (the REIT structure simply isn't that old). But I don't own it today. VTR Dividend Yield (TTM) data by YCharts. The REIT's many strengths are well known to investors, and thus, it has often traded at what I consider to be pricey levels. While it currently trades at a yield higher than its average over the past five years of 4.2%, I still haven't been able to pull the trigger. Part of the reason is the low interest rate environment that has left so many investors searching for yield. REITs are a natural place to look, and I fear the whole sector has been inflated to levels that are undesirable. But what happens when investors get spooked by the market in general? One thing that I think could do that is rising interest rates. As rates go up, expenses head higher for REITs and can put a crimp on bottom-line growth and expansion efforts. But I don't believe slowly rising rates will have a material impact on Ventas' business because it doesn't have significant amounts of debt coming due in any of the next three years (around 5% in 2016, 7.5% in 2017, and 10% in 2018). That means it will have time to adjust to rising rates. Moreover, it's debt to enterprise value, at a little under 40%, is relatively modest, too. And, with an investment grade credit rating, it should have plenty of access to capital even in a difficult market. It's not that Ventas won't see any impact, but that it should be able to handle rising rates in stride. But I do think rising rates could change investors' perception of REIT valuations in general. That, in turn, could lead investors to start indiscriminately selling REIT shares. If it were widespread enough, that selling could quickly take on a life of its own. Look no further than the swift price drop REITs lived through in 2015 for evidence of this risk. I'm personally waiting for a persistent and strong market downturn to buy. Risky environments cause investors to move to assets like cash, short-term bonds, and even gold. The current economic environment might signal the beginning of such a period. The list of signs is long: falling commodity prices, slowing growth in China, a weak earnings season, global political instability, a misstep by the Federal Reserve, and lingering systemic issues from the last recession like heavy government debt loads all come to mind. To see the damage that could happen to Ventas' share price if investors start to run for the sidelines because market prices are falling, take a quick look at the graph above: During the 2007 to 2009 recession, Ventas watched its yield spike to over 10%. It's not that I'm expecting the same type of spike, but the current market turmoil suggests investors are getting scared. Which opens up the possibility that Ventas will get caught up in a selling binge and end up in a good buying range, let's say an over 7% yield. But such a drop will be because of investor emotion, not because of the REIT's underlying fundamentals or business prospects, which should both continue to remain impressive. So, as 2016 progresses, I'm watching this healthcare REIT for an opportunity. 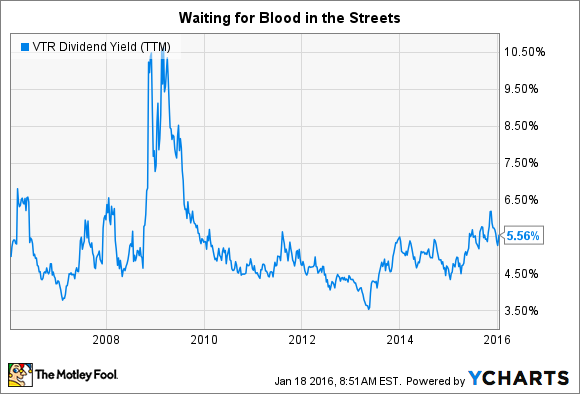 If investors get spooked and the yield jumps to around 7%, Ventas will be on my radar as one of the high-yield stocks I want to own in 2016 and, hopefully, much longer.